Camping Tent Types - What type of camping will you be doing? This is an important question in determining the best camping tent types for you. Will you be car camping or backpacking? Or perhaps camping at a campground in warm weather only, or winter camping in a wilderness area? Decide what kind of tent you will need before you start tent shopping. Family tents are designed mostly for a summer environment, with maximum comfort and good ventilation. Most family outings do not include extreme weather conditions, so an expensive four-season tent isn’t necessary. A summer tent is designed for ventilation and is made of lightweight fabric. They usually have mesh doors and windows that allow the interior air to circulate. Since just about all family camping is done at a campground, weight isn’t usually a concern. So it is a good idea to have the luxury of extra space with a larger tent. Most families love a tent that provides standing room. Find the one that is the most spacious and offers the greatest degree of privacy. The best family camping tents you will find are either a large dome tent or cabin tent. Whatever style you do choose, your tent should be very durable. Family tents in particular are subjected to a lot of rough treatment from active kids and busy parents walking in and out of the tent. 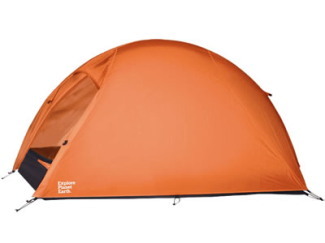 However, be careful if you are purchasing a tent in this category, for this type is also cheaply made and easily purchased at your local discount store. It’s really not a good idea to get a low-priced, poor quality tent for your family camping trips. Cheap tents are difficult to maintain, and make for a frustrating camping experience. Especially when it gets broken the first time out of the bag. Cabin tents are big with high ceilings and large windows. Often they have multi-rooms. If you are not concerned about the weather (wind and rain) during your camping trip, a large quality cabin tent may be the best option. A dome tent is a good choice for a summer or three-season tent. It is a popular, all around tent style for all types of camping. The dome tent is a smaller, but more stable tent. They are also less expensive than cabin tents. If you are camping in one place for a few days, you may enjoy a screen tent. It has mesh sides to keep out the pesky insects, while you can still enjoy your surroundings. It also has a waterproof top that withstands wind and rain. A screen tent provides a convenient place to eat your meals, play cards, or to just relax. 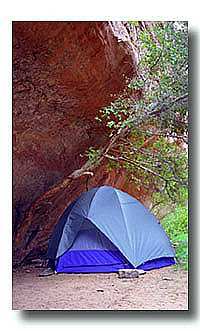 If you are backpacking, the weight of your tent is far more important than a tent for car camping use. Roomy size must be sacrificed. You will want the lightest available tent that still suits your needs. Also you’ll need high quality material and stability in rough weather. A backcountry tent is generally classified as a three-season or four-season tent. Usually the best way to go if you are hiking is to use a solid lightweight 4-season tent. If the weather will not be too extreme, then a 3-season tent will be adequate. For two people one small tent may be just right. However, if there are three or more people, it will probably prove to be better to take along two or more small tents, rather that one large and bulky tent. Of course, it may be worth the effort to split up the tent pieces between group members to bring along a larger tent. When I go backpacking hiking with my son we share a two man tent and weight is our main priority. The tent we use weighs just over 4 pounds (EPE Portal), it isn't a true 4 season tent but has been suitable for cool to mild conditions. A 3-season tent is a good general purpose tent. It is designed perfectly for spring, summer, and fall. It provides first-rate weather protection in all conditions but heavy snowfall and very high winds. The three-season tent is a good choice for those who plan on doing a lot of hiking. They are good quality, very durable, and relatively lightweight. They offer excellent ventilation. Many three-season tents have mesh inner bodies. This reduces breath condensation to a great degree. They also can be used without a fly for cool, bug-proof shelter on hot nights. The three season tent is slightly heavier than a summer tent, but also is less expensive, lighter, and more compact than four-season tents. Unless you’re planning for some serious winter camping, a 3 season tent will be adequate for your needs. Most situations generally need a 3-season camping tent. Because a three-season tent is quite versatile, they are preferred by most backpackers, paddlers and cyclists. If you are hiking in extreme weather, (cold and wet), the best tent is a 4-season tent. Four-season tents, of course, include winter camping. They are generally smaller tents, meant for 1-4 people and they often have vertical walls to shed snow. They also have a large vestibule for storing gear and for cooking. The four-season tents are generally more weather-proof and for their flies usually reach the ground. But this also makes them less ventilated, and more inclined to have interior condensation. Four-season tents are also made with darker, heavier fabrics that have a thicker, waterproof coating. Four-season tents are built with low, curved shapes to shed high winds and heavy snow. They are designed and built to protect campers in heavy weather. The extra protection makes a greater weight and pack size, and may be unwise if you only camp in less extreme conditions. Today’s four-season tents are nearly as light and easy to use as the more general purpose three-season tents from a few years ago. Even if you don’t need an extreme season tent every time you camp, a four-season tent may still suit your purposes. If you use your tent heavily for three-season, and occasionally four-season, the four-season camping tent may offer better wind and weather protection for your needs. Four-season tents are more versatile for all seasons than any other kind of camping tent. Four-season tents do work in all seasons, but are still not intended for rough, and tough winter mountaineering. A mountaineering tent is sometimes a called “fifth season” camping tent that is designed for harsh conditions only. These are the bomb-shelters of the portable tent world, typically designed for hard-core mountaineering. They are usually used for higher altitudes, along cliffs, etc. Mountaineering tents have larger diameter aluminum poles, lower profiles, increased use of guy points, and are much more wind resistant. They can often hold up in 100 mph winds. Mountaineering tents don’t have the comfort of a regular-sized tent as they are designed to be as light as possible. This type of tent is very specialized and is not a good choice for general camping. Single wall tents are an exception to the bulky and heavy four-season tents. They have a ‘no fly’ design which makes the weight per person comparable to a bivy sack’s weight. Single wall tents function best in the cool and dry condition above the snowline. They are made of waterproof-breathable material for this purpose. They don’t seem to do as well in the heat or high humidity of summer or sea level.